The GoboTrap from Ultracoustic is a 36" x 24" x 9" combination studio gobo and bass trap that helps in controlling spill between instruments that need to be playing in the same physical space, while passively removing excessive bass from the room. Constructed from high-density wood, the GoboTrap is apt for use in professional studios, jam rooms, live venues etc. The stackable gobo features 2" fabric covered, high-density sound absorbing panels on both sides that effectively absorb the sound. 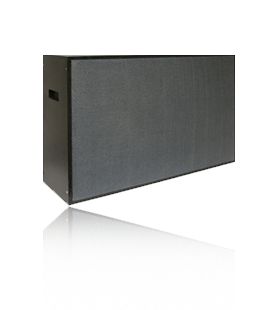 Between them is an internal membrane, a barrier that acts as a sound block for high frequencies and as an impedance barrier for low frequencies. A deep 4.5" internal cavity helps with further bass absorption down to 80Hz.